Teacher Training. The Trust’s priority for 2011-13 is to train teachers. Currently, there is only 1 teacher for every 70 children in South Sudan and only 1 in 5 teachers have received any formal training. At St Jospeh's school in Rokon we currently ony have 1 unqualified teacher for 90 children. We have developed a partnership with an excellent teacher training college in Yei. It costs approx £4,000 to train a teacher. We are aiming to raise the money to train 2 teachers over the next 2 years to work in St Joseph's school from 2014. Rokon Primary School- Phase II. 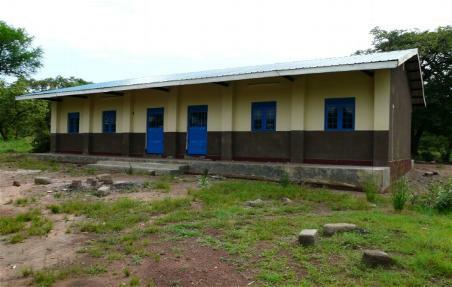 The new school was enhanced through the addition of a kitchen, staff and storage room and latrines. Rokon Primary School- Phase I. Working through the Episcopal Church of Sudan in Juba, the Trust appointed a contractor to build a two classroom primary school in Rokon. The school was completed inSeptember 2008.